Mt. Zion Congregation today is a community of approximately 50 families, who share Jewish spiritual values and traditions as well as care about one another. Our membership is a diverse one, including people who have moved here from various parts of the United States and Israel. There are many opportunities for connecting to our community, including Shabbat Services, which emphasize participation by our members, services commemorating the Jewish Holidays, Torah study, religious education, and congregational dinners and celebrations. We host dinners with our Student Rabbis, discussion groups, Oneg Shabbats, and cultural events. Additionally, we honor all lifecycle events, such as Brit, Baby Naming, Bar and Bat Mitzvahs, and the occasional wedding. Welcome to the Mt. 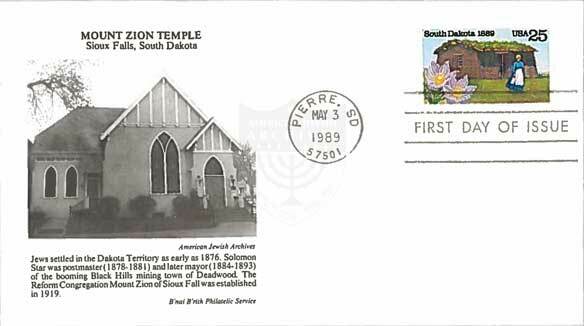 Zion Congregation Jewish Community of today, the proud successor of the oldest continuing Jewish Congregation in the state of South Dakota. Long before statehood in 1889, Jews lived in Sioux Falls. Most of these early families were German in origin and Reform in practice. In 1903 they incorporated the Mt. Zion Cemetery Society and purchased land on West 12th street. In September of 1919, they established a Reform congregation and affiliated with the Union of American Hebrew Congregations. The new congregation was named for Mt. Zion Temple in St. Paul where most of the members of the new congregation had held prior residence. In August of 1920, a rabbi was engaged for the thirty three families. There were twenty children in the religious school. The current home of the congregation was built in 1894 and was purchased from First Lutheran Church in 1924. Extensive remodeling included the stained glass windows that bear the names of the founding members and their relatives. The basement with social hall and kitchen was added in 1951, and the religious school annex was built on the south side of the building in 1958. 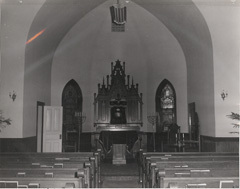 The sanctuary was remodeled in 1962. The congregation’s last full time rabbi was Eugene Hibshman who served from 1953 to his death in 1978. That year he celebrated fifty years since ordination, the last twenty-five as our rabbi. Rabbi Stephen Forstein then served part time until 1984. Since then, the congregation has been served by students from the Hebrew Union Seminary (Cincinnati, OH). Their terms are one to three years. The current membership is fifty families. It is the oldest continuing Jewish congregation in the state. For nine decades it has performed its mission of supporting Jewish spiritual life and values. From the Archives of Hebrew Union College. South Dakota is the home of two famous regions, the Black Hills and the Badlands. The breath­ taking beauty of the Black Hills makes them a favorite American vacation spot. One of the most popular attractions is the Mount Rushmore National Memorial, also known as “The Shrine of Democracy.” The Black Hills gained national fame when an expedition under Col. George A. Custer discovered gold in the area in 1874. Three major tribes of Plains Indians lived in the region before white men arrived. The Arikara lived near the mouth of the Cheyenne River and along the Missouri River. The Cheyenne lived in the Black Hills and along the Cheyenne and White Rivers. The Sioux or Dakota roamed many parts of the region. In 1682, Robert Cavelier, Sieur de la Salle, a French explorer, claimed for France all the land drained by the Mississippi River system. The first white explorers in the area were the French-Canadian explorers Francois and Louis-Joseph La Vèrendrye. In 1743, the brothers buried a lead plate near present-day Fort Pierre as proof that they were there. The lead pipe was dug up by school children in 1913. It is now held by the South Dakota Historical Museum. In 1762, France gave Spain the land claimed by La Salle that lay west of the Mississippi River. Spain ceded the region back to France in 1800. In 1803, the land that is now South Dakota was bought by the U.S. as part of the Louisiana Purchase. The first white settler in South Dakota is believed to be Pierre Dorion, a Frenchman, who arrived in the lower James River Valley near what is now Yankton in about 1782. American explorers Lewis and Clark passed through South Dakota in 1804 and again in 1806. Their reports attracted fur traders to the region. In 1817, Joseph La Framboise, a French fur trader, established a trading post near current Fort Pierre, the first permanent settlement in South Dakota. The arrival of the steamboat “Yellowstone” at Fort Tecumseh, now Fort Pierre, in 1831 proved that steamboats could travel up the Missouri River. This spurred increased fur trade in the area which lasted until the 1850s when the numbers of fur-bearing animals decreased. In 1854, the region became part of the Nebraska Territory. In the late 1850s, agricultural settlers moved west beyond the Missouri River. In 1861, Congress created the Dakota Territory which included North and South Dakota and parts of Wyoming and Montana. During the next two decades, South Dakota became the site of many battles with the Indians. The discovery of gold in the Black Hills in 1874 brought the first rush of prospectors to the area in 1875. After the discovery of the great Homestake Lode in 1876, thousands of miners flocked to the Black Hills. Deadwood, the center of the placer-mining activities, became a notorious wide-open mining town. Between the years 1870-1890, South Dakota’s population grew from under 12,000 to 350,000. On Nov. 2, 1889, South Dakota became the 40th state in the Union. The “Land of Infinite Variety”, South Dakota boasts the famous Black Hills and Badlands as well as areas of fertile soil and grasslands. Its industries include flour mills, meat packing plants, brick and cement factories, lumber mills and canneries, Jews settled in the Dakota Territory as early as 1876. Julius Kuh, Charles and Sam Fantle and Joseph Livingston were among the early settlers as were the Jacobs and Agrant families. Nathan and Amalia (Oppenheimer) Coleman moved from Denver to Deadwood in 1877. Nathan opened a tobacco store. In the following year he was appointed justice of the peace, holding that post until his death in 1906. Coleman officiated at the first Jewish wedding in the Black Hills on Nov. 4, 1879, marrying Rebecca Reubens and David Holzman. Twenty six years later, Coleman performed the wedding ceremony for his daughter Anne, the only one of his three daughters to marry. Amalia and Nathan Coleman and all but one of their children are buried on “Hebrew Hill” in the Jewish section of Deadwood’s Mount Moriah Cemetery. Adjacent are the graves of 44 other pioneer Jews who settled in Deadwood. The first postmaster in Deadwood was thrown out of office for stealing post office funds. His successor was Solomon Star, a local flour merchant who had moved to Deadwood from Montana. Star also had his problems as postmaster. Occupying that post from 1878 to 1881, he was accused, probably unfairly, of participating in a mail fraud scheme that greatly increased the cost of mail delivery in the area, and was forced to leave office. However, Star continued to be active in the community, helping to initiate government in the booming Black Hills mining town, and serving on the first town council and organizing the first fire department. Star later served as mayor of Deadwood from 1884 to 1893. Most South Dakota Jews live in the chief city of the state, Sioux Falls, and Jewish families are scattered in small groups throughout the state. The Reform Congregation Mount Zion of Sioux Falls was established in 1919. The congregation built a synagogue seven years later. A chapter of Hadassah was organized in Sioux Falls in 1937. A B’nai B’rith lodge was founded in the city in 1916. David J. Mendel was in the state legislature from Freeman (1910-1912). Ben Strool was state commissioner of schools and public lands from 1932 to 1938. The town of Strool was named after him.